Well, I didn't believe this day would come, but Twitter day is here. We have created a drag and drop Twitter tool that allows our subscribers to add a twitter "feed" to their website. When I first heard of Twitter I was skeptical but I was also skeptical of Facebook and lets face it - I was wrong. Twitter is getting popular very very quickly and offers many simple convenient ways for you to market your restaurant online. There are three main questions that I need to answer in order to help you take advantage of this potentially potent marketing opportunity. Essentially Twitter is a constant stream of messages. You as a twitter user can follow any number of people or businesses on twitter to keep up with what's going on for them. Your stream of messages will include messages from all these people. Conversely when you post a message, everyone who follows you will get that message. "things are slow tonight: buy-one-get-one-free dinner tonight if you mention this tweet"
at the last minute from your cellphone. That's just plain cool. How do I use Twitter to market my restaurant? You can broadcast specials and events out to all your followers instantly on the night that they are occurring. "OMG. I swear my last customer was Elvis himself. Looks good for a dead guy." "Some lady thought we wouldn't mind if she brought her chimpanzee in to eat with her." "It's been kinda a rough day. Have a round on me. The next 30 beers are free." Mostly it's important not to alienate your potential customers by violating the social standards of Twitter. 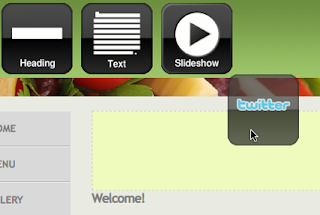 How do I integrate Twitter with my RestaurantZite website? Simply drag this onto your page from the toolbar. Important: if you do not see this tool please send us an email and we will add it to your website immediately. Please mention the page that you want to add it to. Fill in the form with your twitter username. This is the username that identifies you on Twitter. For example my twitter username is bhauman and you can find my twitter stream at http://twitter.com/bhauman. Also select the number of your messages/tweets that you want to show up. Then hit the Save Twitter button and you should be presented with a list of the latest messages that you have Tweeted. Important: if the list is blank you may have misspelled your Twitter username (or you haven't posted any twitter messages yet). Now you have a list of your latest Twitter messages on your website. The messages that show up are only messages that come from you. None of the messages from the people you follow are shown. This gives you the amazing ability to add important or not so important last minute messages to your website from your phone. Also, don't forget to add a heading above your Twitter feed with the Heading tool. Headings like "What's Happening Now" and "Twitter Updates" work great. Also if you have time, please let us know what you think of this tool and if you have come up with any interesting ways to use it. 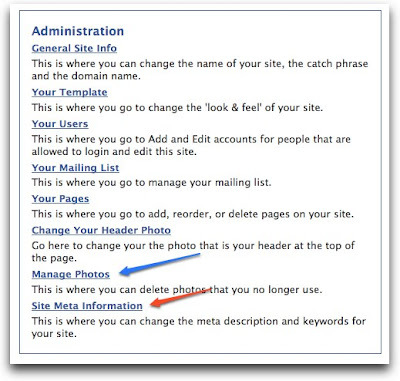 Photo Deletion: you can now delete images that you are no longer using to reduce the clutter in your photo tray. You can find this on your administration page (see the blue arrow on the image below). Meta Tags: you can now edit the meta keywords and meta description for your site. This is also available from the the administration page (see the red arrow). Mailing List Download: any collected email addresses can now be downloaded as a spreadsheet for use in other email systems (the mailing list feature is only available to premium sites). More Slideshow Options: A slideshow can now have one to eight images, allowing you to feature a single large image on the page. The max photo size you can upload is now 8 Megabytes! Stay tuned, we have lots more good things in the works!